SIHH 2017: New Girard-Perregaux Laureato Collection in 34 mm, 38 mm and 42 mm. Hands-on Live Pictures & Pricing. Last year during Baselworld 2016, to celebrate their 225th anniversary Girard-Perregaux brought back the iconic Girard-Perregaux Laureato in a limited edition of 225 pieces in stainless steel with blue or white dial and measuring 41 mm in diameter —we brought you our hands-on review here. This year, Girard-Perregaux was back at the SIHH Salon International de la Haute Horlogerie —after four brief years exhibiting at Baselworld— and to mark their return, they launched a whole new Laureato collection with watches in three different sizes: 34 mm Quartz powered and automatic 38 mm and 42 mm. Below see the Girard-Perregaux Laureato 2016 Limited Edition. The new watches are available in stainless steel, two-tone —titanium with 18K rose gold— or in solid 18K rose gold —only available in 38 mm— and with three dial options. The watches from the new Girard-Perregaux Laureato collection are delivered on strap or on bracelet and fitted with satin brushed cases, satin-brushed bezels and with screw-down crowns. The new Laureato 34 mm is available in steel, 18K rose gold or in a two-tone model and with a bezel set with 56 diamonds. All watches are water resistant to 100 meters. The main differences between the new Laureatos and their Limited Edition counterpart is that the bezel on the limited edition was highly polished throughout, the watch measured 41 mm in diameter and the date disc was white. Inspired by the aesthetics and design of the Audemars Piguet Royal Oak and the IWC Ingenieur SL, the new Girard-Perregaux Laureato stays true to the design cues of the original Laureato launched in 1975 as a direct competitor to the Audemars Piguet Royal Oak. With a very similar case design with a flat top around the bezel and sporting an octagonal-shaped bezel, the new Laureato is like a hybrid between a Royal Oak, an Ingenieur SL and a Patek Nautilus. Originally suggested by Girard-Perregaux’s Italian distributor, the name was inspired by the name in Italian of the film 'The Graduate' from 1967 —Il Laureato— starring Dustin Hoffman, Anne Bancroft and Katharine Ross. As far as the dial, the watches are sold with blue, silvered grey —almost white— or slate grey dial. The dial is extremely nicely done and it features a 'Clous de Paris' hobnail motif slightly similar to that on the Audemars Piguet Royal Oak but with more of a pyramidal cusp on the squares and featuring applied markers with luminescent material and with a date discs that matches the color of the dial respectively. The two-tone model in titanium and 18K rose gold is only sold with slate grey dial. Available on strap or bracelet, the new Girard-Perregaux Laureato Collection looks very good with either option. For those interested in getting the watch on strap, it is worth mentioning that if you go with this option, the watch will be supplied with a black, anthracite grey or white alligator strap and with an additional rubber strap. The straps are equipped with a double folding clasp in titanium with integrated apparent pin buckle look — similar in construction to the clasps on the Zenith El Primero. As you can see in the pictures, the end link connecting the strap to the case of the watch is almost a copycat of the end link on the Patek Philippe Nautilus watches on strap. Therefore, when looking at the new Girard-Perregaux Laureato on strap, there is some similarity with the Patek Philippe Nautilus. As far as the bracelet, the links are satin brushed with mirror polished center links and equipped with a deployant double folding clasp. The bracelet is nicely finished and quite solid in construction. The new Girard-Perregaux Laureato in 42 mm is powered by the automatic Girard-Perregaux in-house calibre GP01800-0008 movement composed of 191 parts and 28 jewels and which provides a power reserve of 54 hours while beating at a frequency of 28,800 vph. Meanwhile, the Laureato 38 mm is powered by the in-house automatic calibre GP03300-0030 with rose gold oscillating weight for the silver and slate grey dials. This smaller calibre is composed of 218 parts and 27 jewels and provides a power reserve of 46 hours when fully wound. The 38 and 42 mm Laureatos are equipped with display case backs, while the 34 mm are equipped with a solid case back. On the wrist, the new Girard-Perregaux Laureato wears true to its size on all three different sizes and with impeccable wrist presence. 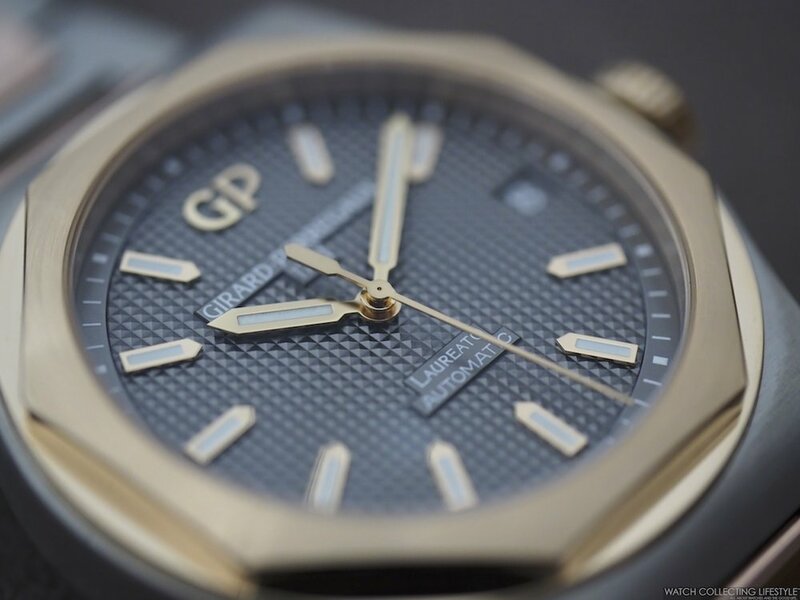 Without a doubt, a great comeback of one of our favorite watches from Girard-Perregaux. As far as pricing, we feel that the watches are priced slightly higher than where they should be, especially for the titanium and 18K rose gold model that starts to get into the Audemars Piguet territory at that price point. When you can get an Audemars Piguet Royal Oak ref. 15400SR in stainless steel and 18K rose gold for only $3K USD more, why would you consider getting the Laureato 42? Sticker Price $11,000 USD for Laureato 42 mm stainless steel on bracelet; $10,300 USD for Laureato 42 mm stainless steel on strap. $22,600 USD for Laureato 42 mm in titanium and 18K rose gold on bracelet; $15,200 USD for Laureato 42 mm in titanium and 18K rose gold on strap. $10,400 USD for Laureato 38 mm stainless steel on bracelet; $9,700 USD for Laureato 38 mm stainless steel on strap. $14,500 USD for Laureato 38 mm stainless steel on bracelet with diamond bezel; $13,700 USD for Laureato 38 mm stainless steel on strap with diamond bezel. $34,300 USD for Laureato 38 mm in 18K rose gold. For more info on Girard-Perregaux click here. Posted on January 30, 2017 by Editor & Publisher and filed under Girard-Perregaux, SIHH 2017, SIHH and tagged Girard-Perregaux Laureato Girard-Perregaux SIHH SIHH 2017 2017 Most Popular.